Driving out of Glacier National Park one immediately enters the vast expanse of prairie that’s owned by the Black Feet Native Tribe. We learned about the Black Feet and other Nations at the Plains Indians Museum in Browning, MT a low key museum full of original artifacts, clothing and stories. 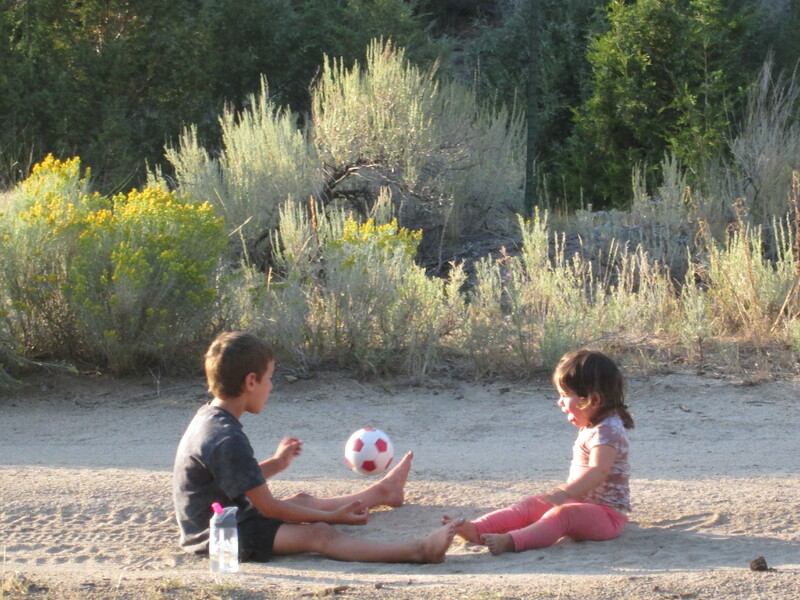 The drive onward was important as it was the first time that the kids ever saw the Great Plains. The first time I (Joseph) drove through the Plains was driving from East to West where the subtle changes from flat Midwest woodlands to Great Plains vastness occurs over hundreds of miles. Here, where the two landscapes collide, may well be one of the most spectacular transitions of scenery on Earth. We moved on to Great Falls to visit the Lewis and Clark museum and replenish our reserves before we continued south to a highly recommended rock climbing area just east of Butte Montana called Spire Rock. This area is comprised of a cluster of granite domes and blocks in the mountainous regions east of the Continental Divide. It sits at about five thousand feet elevation and is completely undeveloped. 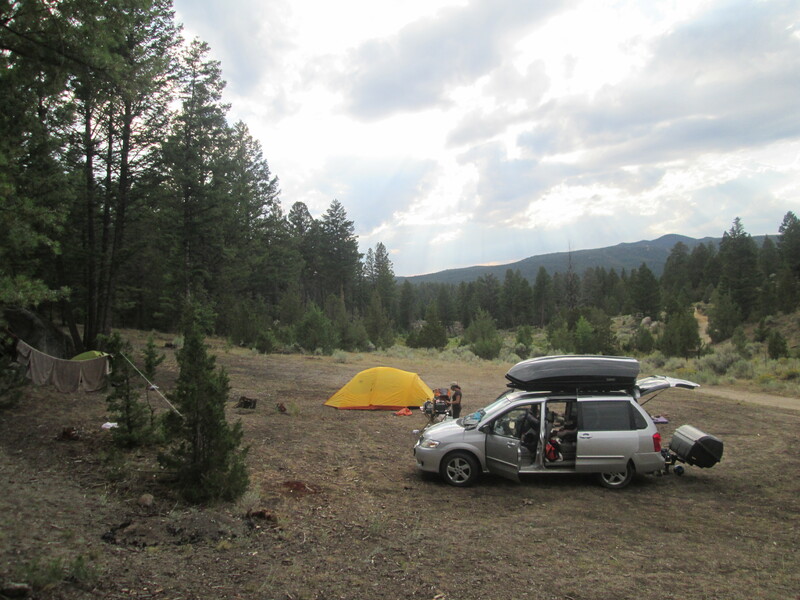 There are networks of National Forest roads that wind around the area and you can set up and camp where ever you want. The forest consisted of some of the Fir species we recognized from further north but there was a well defined increase in Rocky Mountain species found clear down to Arizona, including Pinyon Pine, Juniper, and of course Sage. There was sage everywhere and it smelled delightful. 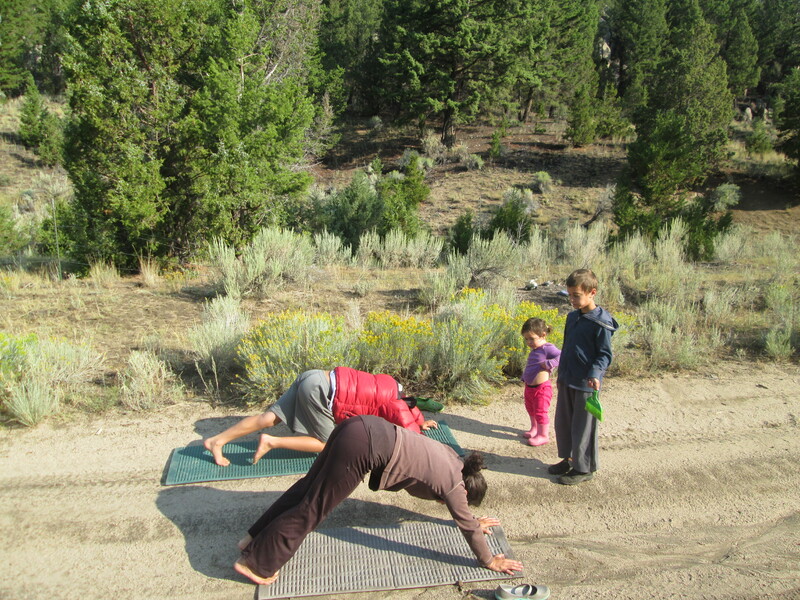 Over the next four days, we relaxed into the landscape rising to the new day with strong coffee, stretching and yoga. The kids joined as they chose. 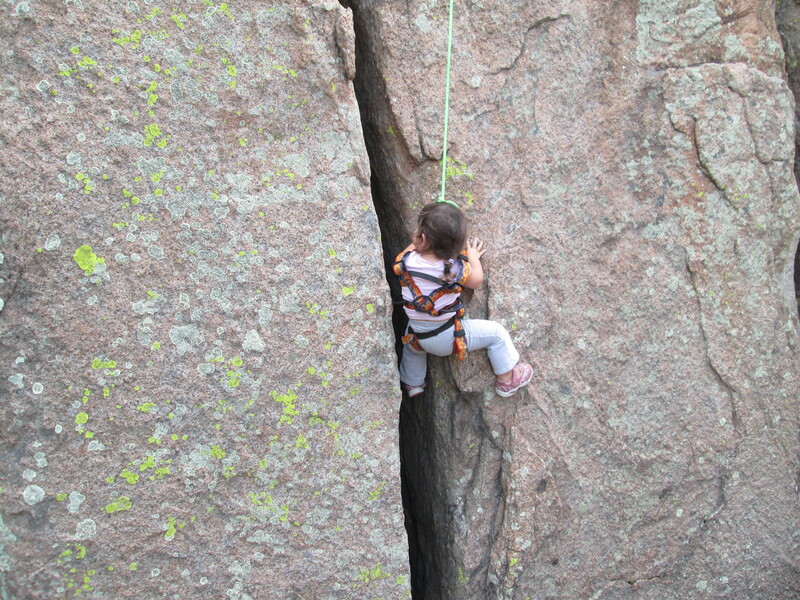 By mid day we meandered to the rock outcroppings and enjoyed clean granite crack climbing. 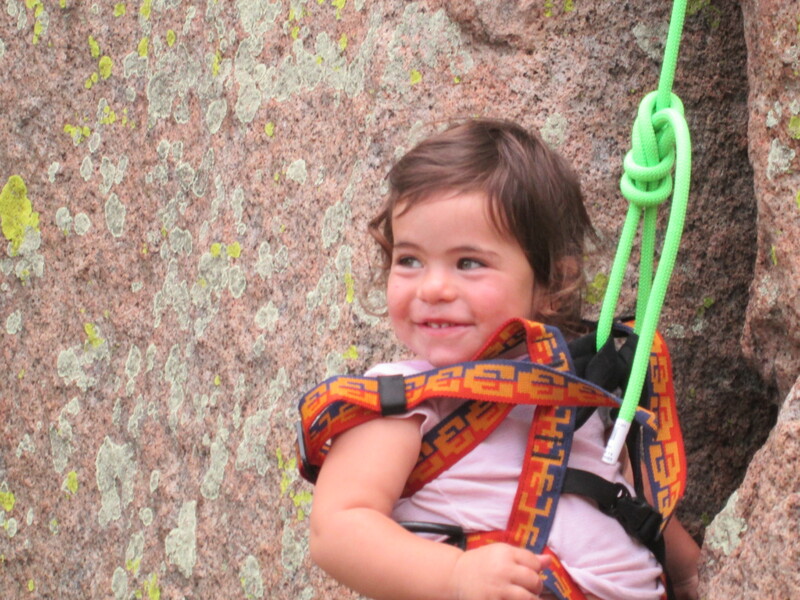 Spire rock is notable as it was Ila’s debut to rock climbing. She eagerly donned her full body harness and asked to go “up up”. She smiled and hung out on the rock about 4-12 feet off the ground at which time she signaled that she was ready to lower. She easily transitioned to napping as we walked back to camp which allowed for the rest of us to work on lessons, different projects and relaxing. At some point we’d start prepping dinner and eat. Each evening ended with tickle fights, wrestling, song circle of kid’s songs and different variations on the family pile ups until it was just too dark to see. This is what we did everyday and frankly if the choice was all mine this is what I would do every day for the rest of my life. Thanks Deena! Hope your return to school is graceful. Sending you a hug from WI. Miss you guys! Looks like you are having a great time! I wish I could see that landscape transition. Your description brings me back to a drive I used to do in Colorado that poured out of the foothills onto an enormous plain. It took my breath away every time. So happy that you guys are living the dream….or maybe Bellingham was the dream and now you’re actually awake? Enjoy for all of us! So much fun reading about your year of “living high” (have you started reading the book?)! 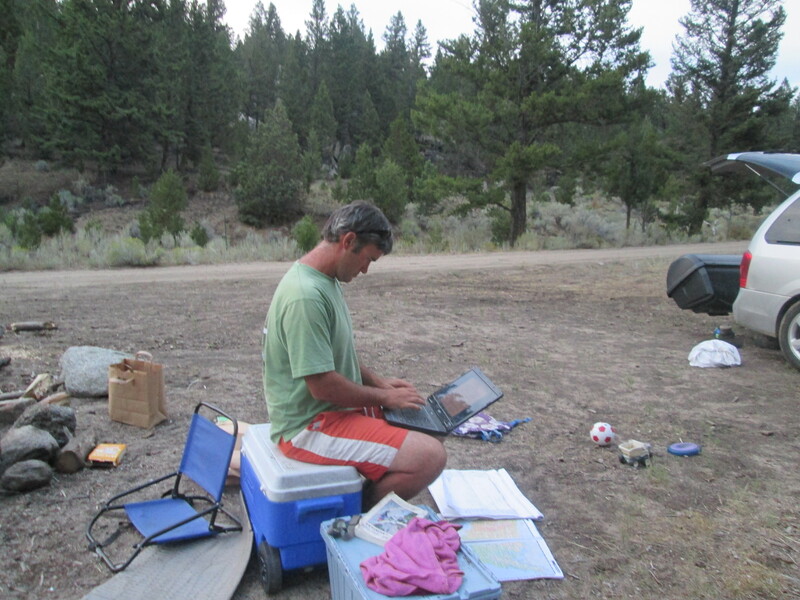 Your description of eastern Montana reminds me of the road trip Noah and I took when I was doing research for my graduate thesis at UM. We experienced the same awe as we drove through the Plains. I guess there’s a reason they call it “Big Sky” country. Yes we have been reading “Living High”. Very fun. Are you all gonna come meet us in California next Spring?